Dundee have released midfielders Iain Davidson and Jamie Reid. 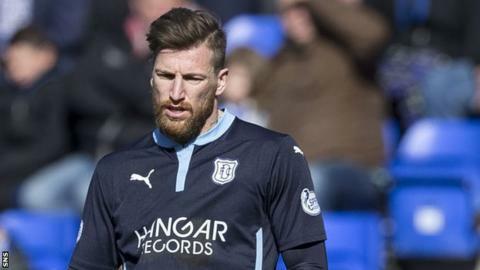 Davidson helped the Dens Park side win last season's Scottish Championship title, but the 31-year-old has made only 14 appearances this term. The 21-year-old Reid spent this season on loan with Stenhousemuir in League One and Elgin City in League Two. Meanwhile, out-of-contract goalkeeper Kyle Letheran has advertised his availability on PFA Scotland's list of players who are looking for new clubs. The 27-year-old, previously of Swansea City, Barnsley and Plymouth Argyle, joined Dundee in 2013 after leaving Kilmarnock. However, he has made only 15 appearances this season as Scott Bain has become first choice. Davidson joined Dundee after leaving Raith Rovers in 2012 and previously played for Brechin City and Scarborough. Reid came through the youth ranks at Dens Park but has only made six appearances for the Premiership outfit. He scored four goals in 15 appearances since joining Elgin on loan.